Yes it was instant. 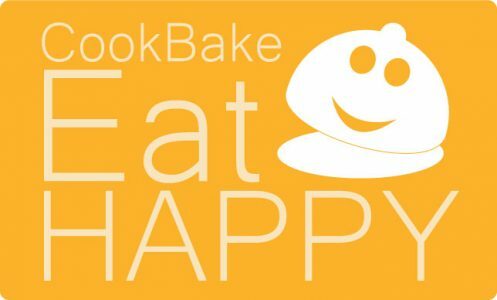 I fell in love with my Instant Pot ever since we met. We have made a lot of wonderful meal together. So tasty and fast that we have so much time to get to know each other better, every second we spend together. One of our favorite thing to make, besides millions on them, is spaghetti. 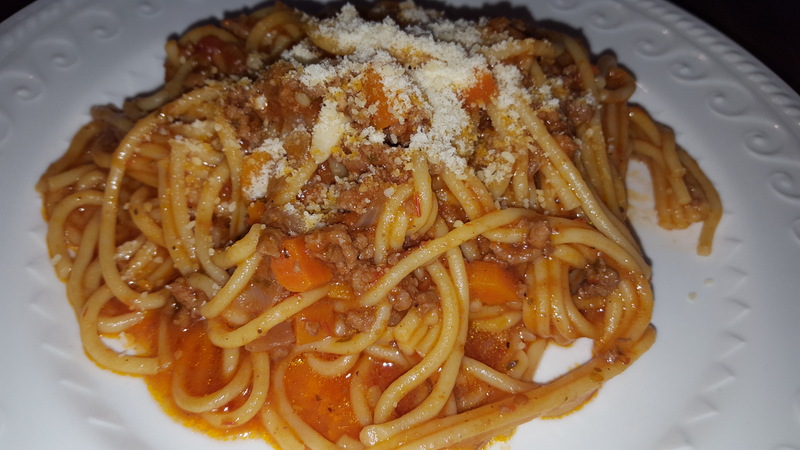 The fact that it only takes 8 minutes cooking under pressure and for this wonderful plate of spaghetti, what can I say…just wonderful. Some people complain that it was actually cook longer than 8 minutes. True! 8 minutes when it start cooking. Does not include the time doing the mis an place a.k.a. prepping the ingredients ready for cooking. 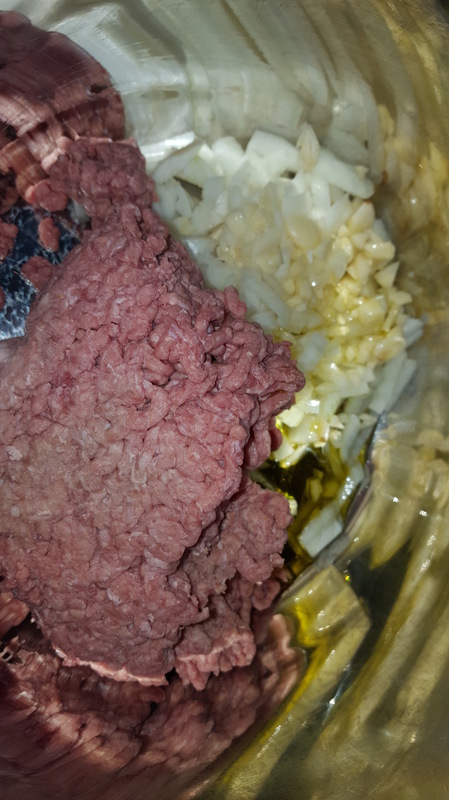 2 lbs ground beef that we open the package and dump in the pot. Then chopped 1 small yellow onion and 5 cloves garlic and dump these 2 in the pot along with the beef. Then peeled and diced 5 carrots, mine was skinny so I used 5. You can do 2 big ones. Pour 2 tablespoons olive oil to the pot. 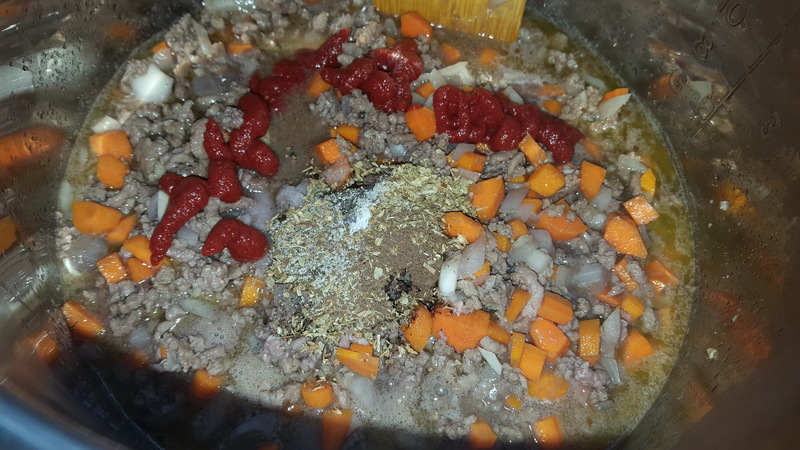 Other thing we need are, 3 tablespoons tomato paste, 1 big can of tomato puree, 1 cup red wine, I am using merlot. 1 cup of water to 2 cups if you want more sauce. And of course the spaghetti, 1 box. Not gonna be spaghetti without it. 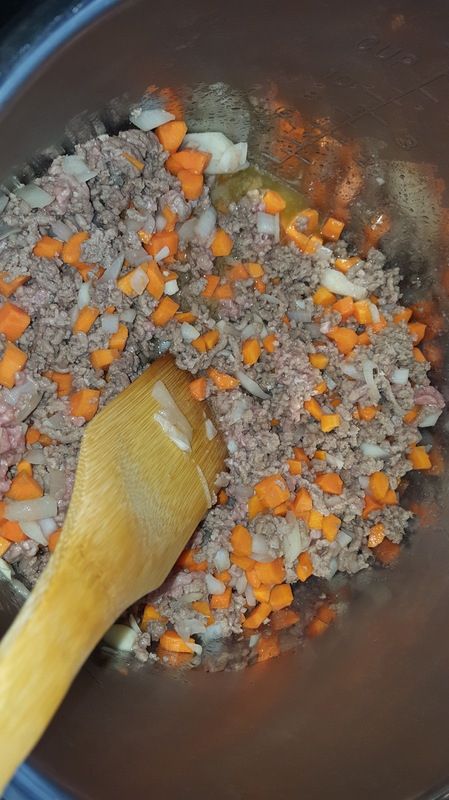 We will be just making bolognese won’t we. The seasoning are 2 teaspoons salt, 1 teaspoon black pepper, 2 teaspoons oregano, 1 teaspoon nutmeg, 1 teaspoon white sugar. See all in the pot, meat, onion, garlic and olive oil. 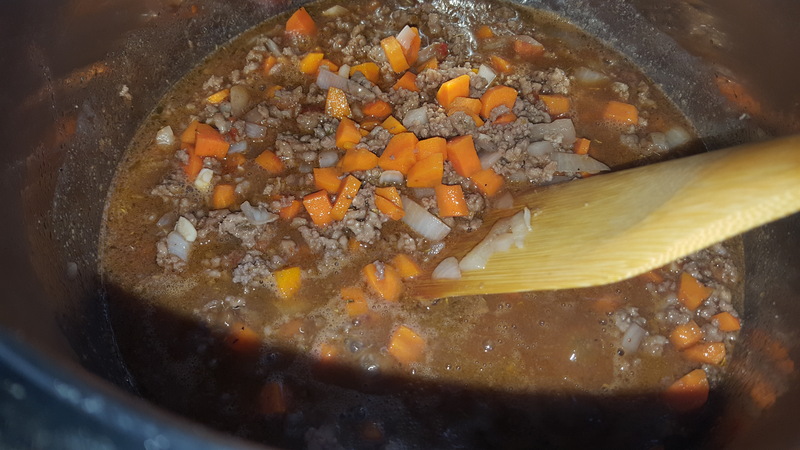 Press sautee and cook until beef are cooked and the onion softened. Then add the diced carrots. Stir the pot. Wow that does not sound nice lol. Add the tomato paste, seasoning and give it a stir to combine the whole thing. See they are mingled at the party in the pot. Now it is safe to have the tomato puree entering the party. 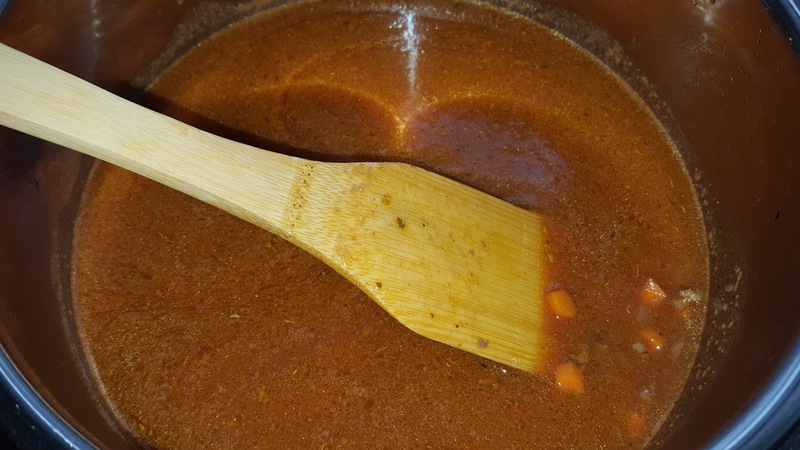 Once the tomato puree and water dropped into the pot, turn the Instant pot off, add the spaghetti in and kind of push them down so they are covered with the sauce. Closed the lid, sealed the vent, press manual and adjust the time to 8 minutes. When it beeped, your food is done. QR, release the pressure by opening the vent. Give them a stir again and serve. 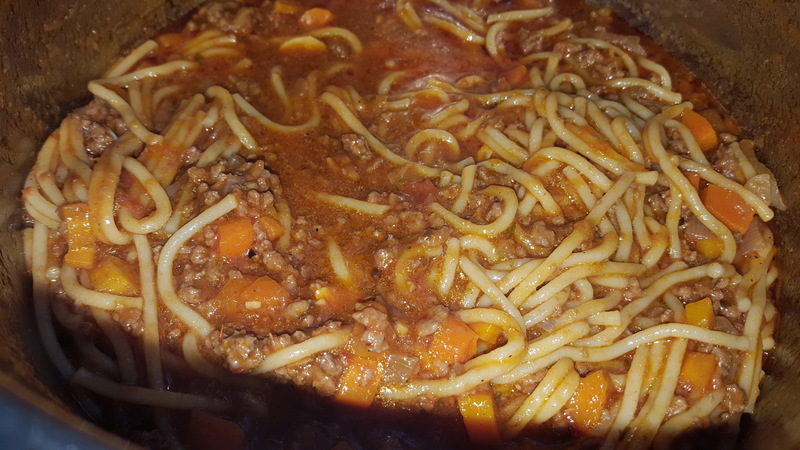 One pot got dirty, one chopping board, the house stays cool, I have time to catch up with tv series while spaghetti and the sauce cooking at the same time, my boys happy… why not making spaghetti in the Instant Pot??? why? why not?